Why Theology or Religious Studies? 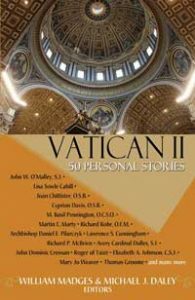 William Madges, Professor of Theology and Religious Studies, is the editor of Vatican II: 50 Personal Stories, published by Orbis Books in July 2012. The book received second place for the category, 50th Anniversary of Vatican II, in the 2013 book awards from the Catholic Press Association of the United States and Canada. The CPA remarked: “What an interesting and absorbing book! It tells the story of Vatican II through the revelatory experiences and personal assessment of distinguished Catholic and non-Catholic authors. Covering a wide scope of topics, this book is a treasure trove of valuable insights.” Congratulations to Professor Madges! Ever heard of the Bible Riots in Philadelphia? Well, now’s your chance to learn about them. As part of Routledge’s series, Critical Moments in American History, Katie Oxx‘s new book looks at key events in the anti-Catholic movement of the mid-1800s. The book is The Nativist Movement in America: Religious Conflict in the Nineteenth Century, published this past spring (2013). It explores and contextualizes events such as the burning of a convent in Massachusetts, the Philadelphia Bible Riots, and the theft of the so-called Pope’s Stone in Washington D.C. The riots took place in 1844 in the neighborhoods of Kensington and Southwark. Dr. Oxx’s book contains a number of records and other documents from that time and has its own Web site with additional resources. The Dialogue Forum and Peace Islands Institute recently awarded Professor Phil Cunningham its Peace and Dialogue Award for promoting interfaith understanding. The Social Science Research Council (SSRC), an independent, nonprofit international organization founded in 1923 and based in Brooklyn, New York, has awarded Dr. Susan Andrews a Postdoctoral Fellowship for Transregional Research on Inter-Asian Contexts and Connections. The fellowship provides nearly $70,000 in funding for Dr. Andrews’ project, “Replicating Replicas: The Creation of the Pan-Asian Mount Wutai Cult in Pre-Fourteenth Century China, Korea, and Japan.” The project will contribute to the understanding of the connections between seemingly distant locales in East Asia through a careful study of the ways that Wutai narratives and practices were preserved, transformed, and used to new ends in China, Korea, and Japan. The award will allow Dr. Andrews to participate in workshops and conferences in Turkey, China, Belgium, and Austria over the next year. Last month, Dr. Bruce Wells was inducted into the Alpha Sigma Nu Jesuit honor society and was selected to receive this academic year’s teaching award from the local SJU chapter. The Department of Theology and Religious Studies will host a reception in honor of Dr. Isra Yazicioglu on the publication of her new book, Understanding the Qurʾanic Miracle Stories in the Modern Age (see below). The reception will begin at 5:00 p.m. on Wednesday, March 26th, in the Clifford Board Room on the 2nd floor of Bellarmine Hall. Professor Philip A. Cunningham was elected president of the International Council of Christians and Jews (ICCJ) at its conference last month in Buenos Aires. The ICCJ is an umbrella organization of 38 Jewish-Christian dialogue organizations engaged in the renewal of Jewish-Christian relations. Professor Cunningham directs SJU’s Institute for Jewish-Catholic Relations. He is recognized internationally as an expert in Jewish-Christian relations and interreligious dialogue. He is the author or editor of numerous books and articles on the topic. Most recently, he co-edited the acclaimed research project and book, Christ Jesus and the Jewish People Today: New Explorations of Theological Interrelationships. He will serve a three-year term as the ICCJ’s president. This is a wonderful honor and an important recognition of Professor Cunningham’s efforts on behalf of Jewish-Christian relations over the years.